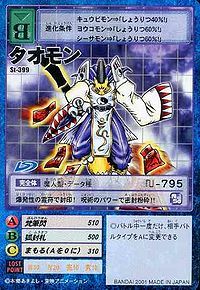 Versed in Onmyoudou, it is an onmyouji Digimon that freely uses every technique in battle. Its faculty with magic is particularly high, and attacks with talismans and spells are its forte. Also, it is a master of concealed weapons, and hides various weapons up its sleeves. It doesn't talk very much due to its extreme reticence, and it is a being that lives and lurks within the darkness. 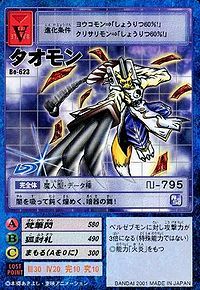 Also, it is able to turn its talismans into shikigami and command them. Its Signature Move is wreathing its talismans around the opponent's body, then detonating them (Kofūsatsu). 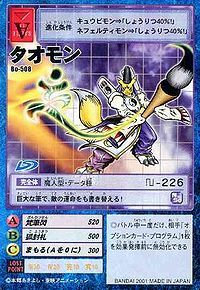 Its Special Move "Bonhitsusen" is chanting an incantation while painting the Sanskrit character " " in the air with its gigantic brush, then hurling it at the opponent. 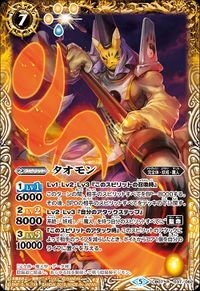 An opponent that is hit with Bonhitsusen gets caught in a gigantic explosion and is annihilated. It shouts "Bon-Hitsu-Sen" as it paints the Sanskrit character. Holy Beast type, Perfect level, Data attribute. Its Special Move is Bonhitsusen. — Digimon Tamers: "Beautiful Evolution! 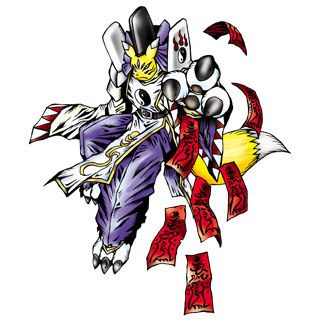 Taomon Dances in the Moonlight"
This profile matches the one used on the Digimon World -next 0rder- site. n., From Tao 「道」, a philosophical school of thought started in ancient China. 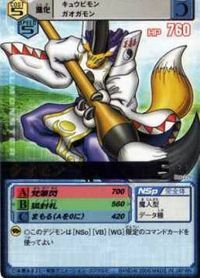 Kofūsatsu  Fox Seal Paper 狐封札 N/A Thousand Spell/Kofusatsu/Fox Card/Lethal Cards Uses paper seals to attack the enemy. Bonhitsusen  Buddhist Brush Brandish 梵筆閃 N/A Talisman of Light/Bonhitsusen/Brush Strike Uses a large calligraphy brush to paint a seal in the air to destroy the enemy with white energy. 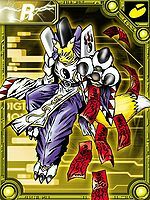 トリニティバースト Toriniti Bāsuto Trinity Burst/Trinity Attack Combines powers with Megalo Growmon and Rapidmon to become a burst of rainbow colored energy that pierces the foe. 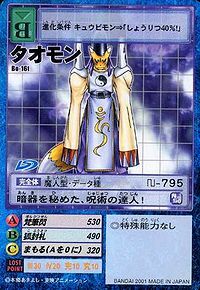 オン On Talisman Spell/On Creates a large hemispherical shield atop a yin-yang sign that Taomon can move at will. It can also be used to electrocute an enemy caught in it. 塵染 Rajasu Talisman Star/Symbol Blade Creates a seal and throws it like a shuriken. Ippitsu  One Stroke 一筆 N/A Brush Stroke Hits the enemy with a brush stroke. Issen  One Flash 一閃 N/A Symbol Bomb Attacks with a shining brush stroke. 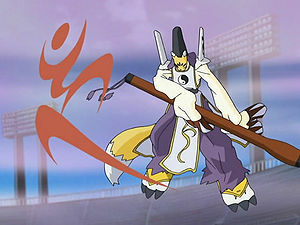 Taomon is the partner of Makino Ruki. 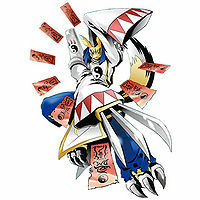 Kyubimon evolves to Taomon in the fight against Vajramon, who wanted turn against Taomon to the humans. 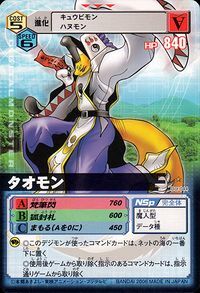 Can be evolved from Kyubimon if above level 32 and Holy EXP above 5000, or can be found at Sky Palace. 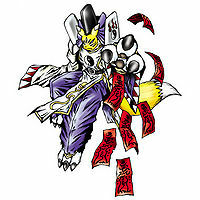 It can evolve to Kuzuhamon if above level 50 and Spirit above 270, or Sakuyamon if above level 48 and Holy EXP above 15000. 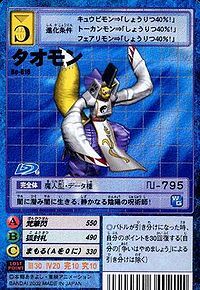 An NPC Taomon also gives you a request mission to get a 100% scan data of Ikkakumon at Sewage Tunnel, in order to use Ikkakumon's fur for their fude brush. 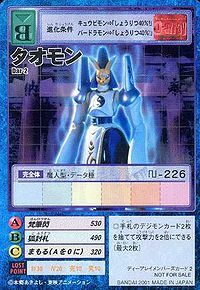 Can be evolved from Kyubimon if above level 36, friendship 80%, and spirit 185. 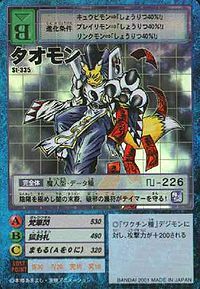 Can evolve to Sakuyamon if above level 52, Holy EXP 1600, and already have Kuzuhamon in party. A descendant of darkness who has mastered the powers of Yin and Yang. Its charms repel evil and protect its Tamer! It seals the opponent with explosive talismans, and causes them to blow up with its incantations!! Using its giant brush, it is able to rewrite even the fates of its enemies! It dances with its hidden weapons that shine dully as they absorb the darkness! This silent onmyouji mage lurks in and lives with the darkness! A master magician armed with hidden weapons! Possessing high spiritual power and being well-versed in Onmyoudou, it has mastered all kinds of Onmyou arts. It specializes in dispatching its opponents in the dark, using the talismans and weapons it hides beneath its sleeves. 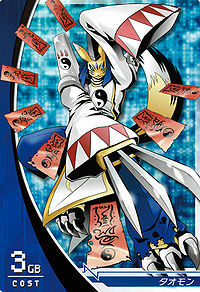 Versed in Onmyoudou, it is an onmyouji Digimon that freely uses every technique in battle. 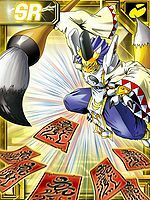 ↑ 7.0 7.1 Digimon Tamers: "Digimon Total Sortie! Advancing while Facing the Wind"
↑ Rajas (Sanskrit: रजस, Chinese: 尘染) is one of the three Gunas or divisions in the relationships between matter and nature, representing form and change in Hindu philosophy. This page was last modified on 20 November 2018, at 17:38.